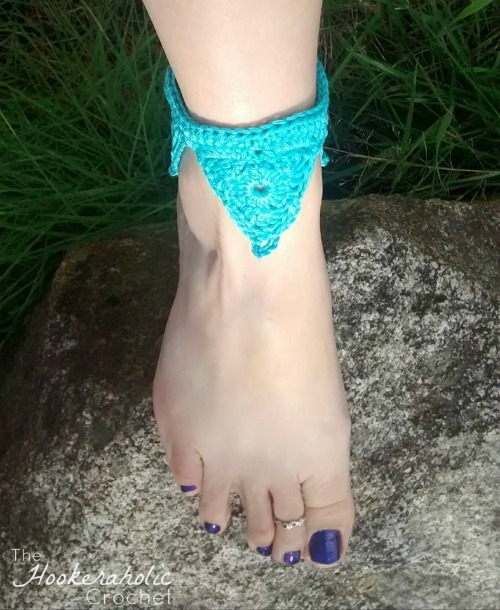 Here is a fun bohemian ankle cuff design that you are sure to love on those days at the beach. Quick and easy! You can use Size 3 or 5 thread for this design. Even try Size 10 thread for a smaller fit. Work same R1 and R2 as above. R3: *ch 5, sl st in center of picot, ch 5, sl st in center of same picot, ch5, sl st in next sc, rep from * 2 times, ch 5, sl st in center of picot, ch5, remove hook and insert from rs down in one of the ch5 spaces on a corner (where a picot is) grab your ch 5 stitch and pull through, cut your thread about 5 inches or so from your hook and pull the thread through, sl st in same picot, ch 5, sl st to join. After 3rd motif is joined finish off and weave in ends. Attach thread to rs of motifs to the ch5 at the picot. R1: ch1, 2 hdc in first ch5, *6 hdc in each of next 2 ch5 spaces, 2 hdc in each of next 2 ch5 spaces (which are the picots), rep from * to end. R2: ch1, turn, hdc in each st across to end, ch 50. Attach thread to opposite end of cuff and ch 50 for other tie. R2: ch1, turn, hdc in each st across to end, ch 50. Cut off. Attach thread to opposite end of cuff and ch 50 for other tie. Cut off. 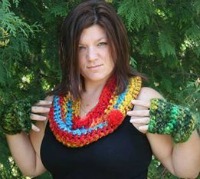 I hope you enjoyed the Bermuda Triangle Ankle Cuff free crochet pattern.